GOSH archivist Nicholas Baldwin (M.A., M.Litt.) chronicles GOSH's 150 years. At the time of the hospital’s foundation, the population of London had grown hugely in the preceding decades, following the Industrial Revolution and the end of the wars with Napoleon’s France. This growth was not, however, matched by growth in hospital provision for the City, and the few long-established general hospitals, such as St. Bartholomew’s and Guy’s, struggled to cope with the increase in demand. In these circumstances, the hospital care available to the many thousands of children living in poverty in London was minimal, and a low social priority. A survey in 1843 revealed that, of some 2,400 patients in all the London hospitals, only 26 were children under 10 years of age; of 51,000 people dying that year in the capital, 21,000 were children under 10. It was generally assumed that children were "expendable", and better off staying with their mothers even when seriously ill. What little healthcare that was available before Great Ormond Street Hospital opened was largely provided by various Dispensaries for Women and Children, in modem terms a cross between a pharmacy and a hospital outpatients’ department. Dr. Charles West, the principal founder of Great Ormond Street Hospital, was an expert on Gynaecology and diseases of women and children. He had trained in Medicine at Paris and Bonn, in countries where provision for children’s health was already more advanced than in Britain, and where hospitals exclusively for children had been long established. In the 1840’s, West worked at the Universal Dispensary in Waterloo Road. When he failed to persuade its management of the need to become a fully-fledged hospital for children with in-patient beds, West determined to set up the first children’s hospital in Britain. 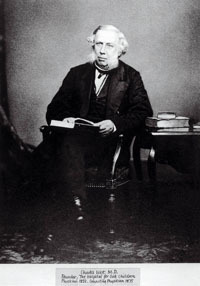 Through his own efforts, and through social contacts made by his fellow doctor, Henry Bence-Jones, a committee was formed in 1850 for this purpose, with support from eminent philanthropists and public health reformers such as Lord Shaftesbury, Baroness Burdett-Coutts and Edwin Chadwick of the Board of Health. By February 1852, sufficient backing had been obtained to open The Hospital for Sick Children at No. 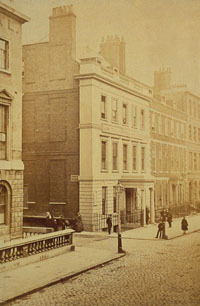 49 Great Ormond Street, a mansion with a previous medical connection; it had been the home of Queen Anne’s physician, Dr. Richard Mead, 150 years earlier, and the large extension Mead had built to house his library became the first hospital ward. Dr. West had three principal ambitions for the hospital, which remain the basis of its work today: the provision of healthcare in all fields to the children of the poor, the encouragement of clinical research in paediatrics, and the training of paediatric nurses.